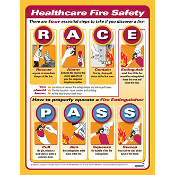 Our talented design team can customize any of our RACE PASS Fire Safety products to meet your needs. If you can dream it, we can design it! We'll work with you to create custom sizes, translate a language, write new content, change colors and photography, or create an entirely new custom design. Just give us a call at (877) 646-5877 and we'll be happy to discuss your needs and provide an estimate. 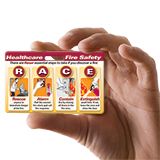 Our Badgie Cards feature full-color graphics (front and back) and gloss lamination finish, with side slot or vertical slot and rounded safety corners. .30 mil thick. Not sure if our badgie cards fit your ID? Our Signs are printed digitally with Vivera® Inks on our exclusive ReStix™ repositionable vinyl and finished with disinfectant-safe ProteX™ Satina™ laminate. They also feature a 100 year no-fade guarantee.